Today is the day we celebrate the signing of our Constitution, on September 17th, 1787. Two hundred and thirty-one years later, we look back at the history of the Constitution, and we realize how rare and fine the founders&apos; thoughts were. 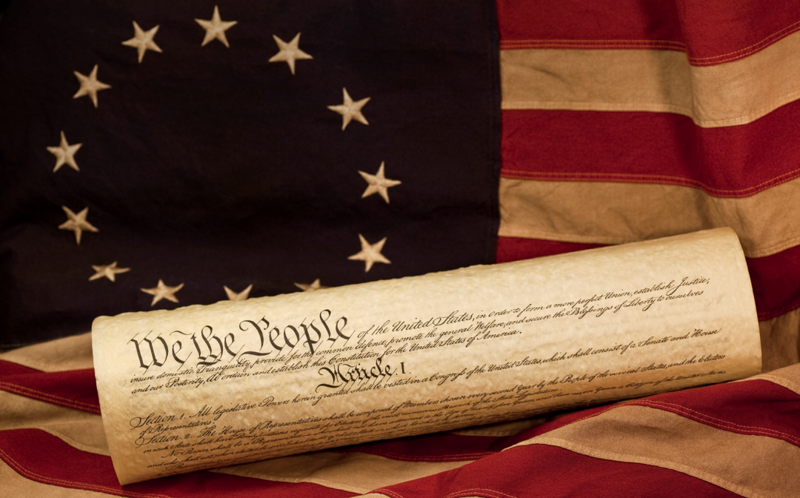 Our Constitution has been amended only 27 times, and ten of those, the Bill of Rights, were entered all at once. So really we&apos;ve only amended the Constitution 18 times in total, which is remarkable. There have been only a few times in our history when we&apos;ve felt the overwhelming need to change the master plan, that the Constitution wasn&apos;t clear enough or defined precisely. In comparison, between 1876 and 2015, the Texas Constitution has been amended 491 times. I am sure that one of the reasons for our Constitution&apos;s success is prayer. The delegates were struggling to create a lasting Constitution when Benjamin Franklin reminded them of the importance of praying for divine guidance. The Constitutional Convention then began each day in prayer and where able to give us a governing document that has stood the test of time. Let&apos;s look back at the hot and steamy summer our founders spent in Philadelphia in order to fix the issues with the relatively new United States government. They had a government already, called the Articles of Confederation. However, it had been proven to be ineffective in several ways, most notably that the federal government had to rely on the states for all money and military forces. When a rebellion arose in Massachusetts, the national government was powerless to stop it. However, to amend the AOC would require the agreement of ALL 13 states, which was highly unlikely. Once the delegates arrived in Philadelphia, they decided to make all proceedings secret. So they shuttered all the windows, hung heavy drapes in front of the windows and the doors, and sweated inside in their woolen coats and hose, with air conditioning a dream of the far future. Sometimes I think that they accomplished so much that summer because of their discomfort. I wonder, would Congress today be so slow without air conditioning, frequent breaks and access to their offices? Despite the secrecy of the time, we know all the details of the Convention through the letters of the founders and through the extremely detailed notes of the “Father of the Constitution”, James Madison. The Convention started off with a bang. Virginia, represented largely by the diminutive but brilliant Madison, wanted to create a legislature where large states would have the most power. Smaller states were instantly offended, as they would lose in that scenario. After very contentious discussions, a compromise was suggested by Roger Sherman of Connecticut, to have a legislature that would represent population in the lower chamber, the House of Representatives, and represent state legislatures in the upper house, the Senate. So larger states would rule the lower house, but the upper house would give equal representation to all states. It was called the Great Compromise, and it was the first compromise of several that our founders would make to preserve what they often called the “confederation of states”. The next compromise would concern the power of the executive branch. The Articles of Confederation had no president, no one person with administrative or executive power in the federal government. All power went to the states and their representation. In the Constitutional Convention, it was acknowledged that the lack of an executive had led in part to Shay&apos;s Rebellion in Massachusetts, so they agreed they needed a leader for the national government. However, agreeing in principle was much different than agreeing on the details. They took more than 60 votes on this issue, finally agreeing on a “College of Electors” who would choose the president. Thus was born the Electoral College system that we have today, who choose the president somewhat independently of both the popular vote and the legislatures who choose them, depending on their individual state laws. The delegates also made a sad compromise, but saved the union of 13 states, as Southern states threatened to dissolve the United States over the issue of slavery, the slave trade, and representation. As terrible as it was, Southern states wanted to continue the African slave trade and wanted all their slaves counted as people for the sole purpose of representation, which would make them more important in the House of Representatives. Northern states, on the other hand, didn&apos;t want slaves to count as people for representation, but wanted them to count as property for the sake of taxes, so the Southern states would pay more in taxation to the federal treasury. Despite the general attitude, even at that time, that slavery was wrong, the majority of the founders acknowledged that the Southern states would not stay in the union without a compromise. After much conversation, many votes and many rude statements, a compromise was struck. The slave trade would be allowed to last until 1808, or 20 years, and each slave would count as 3/5ths of a person for the purposes of BOTH representation and taxation. So the South would have more representatives in Congress, but they would pay for the privilege in more taxes. Our founders were wise men, but they were not superhuman, and they made many errors in their plans. One such error, that we can look back at and mourn, is that they pushed the issue of slavery to the next generation to solve. We know from our history that America did not solve slavery in 1808, or 1828, or 1858. It took the bloodiest war in our history to solve that issue, and more than a hundred years passed after that before our country stood up for the equal legal rights of African Americans. At any point, if any state had walked away from the Convention, the entire project might have been lost! The founders made multiple compromises, said terrible things to each other in secret, and felt both the burden and the bonus of representing the millions of Americans and their lives going forward. They knew that history would judge them for what they did and said in Philadelphia in the summer of 1787, and acted accordingly. Today, with the knowledge that our country is not perfect, I still rejoice that I live here, and have the freedoms and individualism that America was founded upon. I am overjoyed every time I read the Constitution, or speak on it to my students. It&apos;s not just a document, it&apos;s a statement of values and a statement of who we want to be as a people. We&apos;re not there yet, but as a country, we still are moving toward our ideals. Our Constitution is precious. Let&apos;s celebrate it today.